Here is a video that illustrates we can use the mailbox of mobile phones to take action in the Inbasket of ProcessFlow Integrator (PFI). The video is a working demo for the BlackBerry and dates from September 2009, but the concept is still valid today and could apply to iPhones and Android devices as well. The scenario is the following. 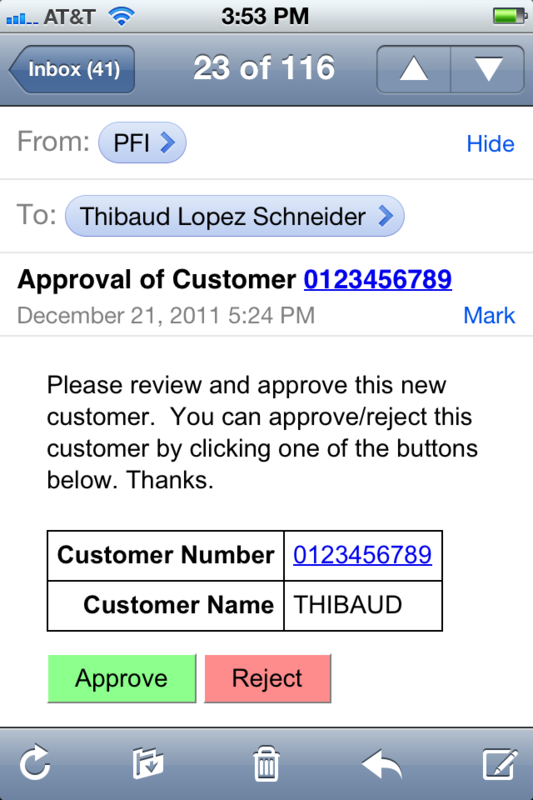 We have a workflow where approvers need to review certain information and take action, for example Approve or Reject. In this particular scenario the buttons to approve and reject are embedded in the email such that approvers can take action directly from their mailbox, i.e. we are not discussing the scenario of the Inbasket in Lawson Smart Office (LSO). The reason to use emails instead of the Inbasket is that taking action from the mailbox works from mobile phones that have network access to the PFI server, such as corporate mobile phones. An alternative to the mailbox for corporate mobile phones would to use the Mobile Inbasket. Finally, the demo in the video challenges the user for authentication, but there is also a solution with single sign-on to skip the user/password part. If you are interested in the solution, contact me for details.